Stephanie Theodore gets the prize for press release of the day for her five deceptively simple takes on Jason Tomme’s exhibition. 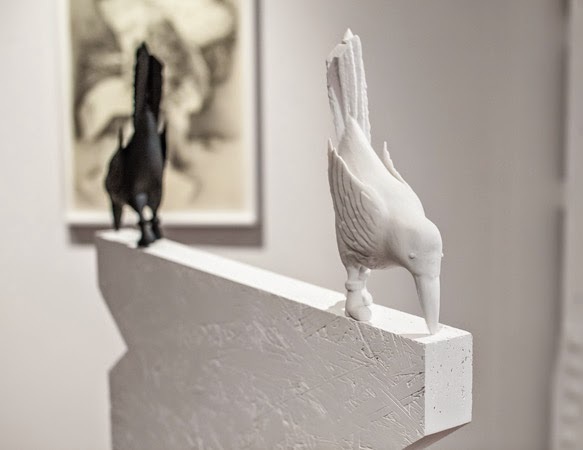 The show is a compelling mix of different media, from wood and stone sculptures and found objects to finely detailed pencil drawings, which I can imagine the artist making alone, in his studio, contemplating art’s need for solitude, all the while longing for human companionship and conversation. We can all relate to that. 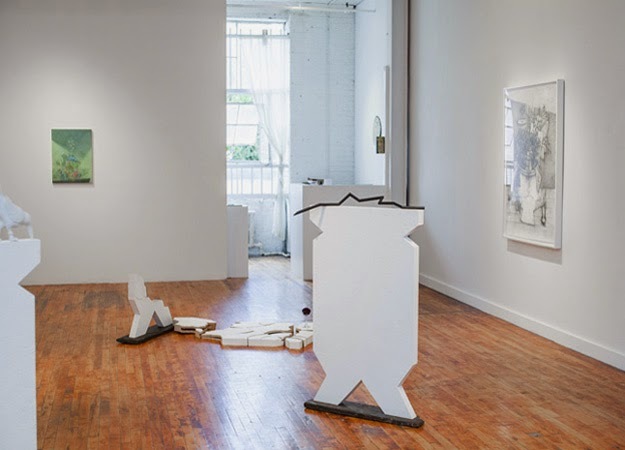 Jason Tomme, installation view at Theodore:Art. Here’s the meat of the PR text. Take One: Charlie writes to Charles of the “undeniable beauty” and “lingering disquiet” of the “strange kingless space” in which he finds himself. Like the damp, debris-strewn rooms at the center of Andrei Tarkovsky’s films, this uneasy place seems an illusory realm beyond the veil of appearances. Take Two: It’s good to be lonely. Really, it’s fine. Take Three: When a loved one passes, the heart goes kablooey. Take Four: Donald Rumsfeld hit the nail on the head when he spoke about “Known Unknowns”. Take Five: Drawing, painting, sculpture splayed into a single room. 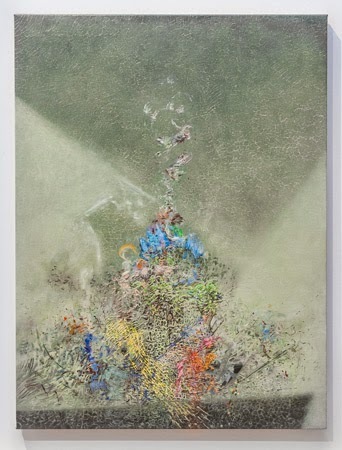 A series of meticulous graphite drawings of potted plants, a new painting from the ongoing series “Crack Paintings”, and a myriad of new sculpture serve as wondrous artifacts to an inquisitive look at solitude, imagination, and location. Jason Tomme, Untitled Object # 2, (detail) 2014; OSB, stone, acrylic paint, 3-D printed composite. 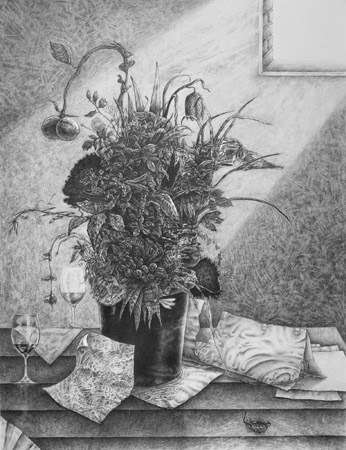 Jason Tomme, Potted Plants: When Sunshine, 2014; graphite on paper – paper size: 50 x 38 inches. “Jason Tomme: in a desert, on and island, in a room,” Theodore:Art, Bushwick, Brooklyn, NY. Through October 19, 2014.